Note from shop owner Thank you so much for stopping by VulpeMica today! We are currently taking a bit of a break while I work on a new brand. Also, check out my design page for some of my art! Thank you so much for stopping by VulpeMica today! We are currently taking a bit of a break while I work on a new brand. VulpeMica was very kind and my daughter loves her blanket! It’s perfect! This was such a special blanket for my family. I gave it to my sister and brother-in-law at their baby shower for their first child. It was monogrammed beautifully, great quality of fabrics and my nephew seems to find it pretty cozy over on the east coast in January! Thank you so much for the beautiful blanket that will remind him of his auntie across the country!! My daughter got this as a Christmas gift as we transitioned her to a big girl bed. All weekend she's been bringing everyone to her room to show off her purple dinosaurs! New lovey size blanket with the purple floral cotton in store today! A great keepsake or comfort item for your little one! 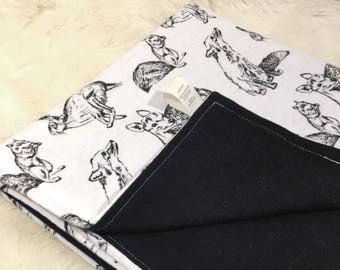 Forest Friends Flannel fabric has a new pairing! Get it either with olive green flannel or now with black flannel! If you would like a different size or color than what I have in shop, check out the custom order listing! Fabric always looks very different as a finished product and this blanket sort of blew me away. It’s so bright and fun! A gorgeous cotton pink floral with an aqua flannel lining. Creativity has been a part of who I am since the beginning. I am happiest in the outdoors where I find most of my inspiration. Writing, drawing, sewing, you name it, I love doing it and have been doing it from a young age. This store is more than a business to me, its more than making and selling... this store is an expression of my creativity and the things I love. Every blanket I make, I want to keep because each one is made with a part of my heart put into it. I am a people person and love building relationships, please feel free to contact me with any questions or concerns. My hope and vision is that you will find as much joy in receiving and using my items as I have making them and sending them out to you. Hello! I am a mother of two who is based out of Spokane. I have loved to blog and create since I was young. After having two kids, I am excited now to re-enter the creative world. I can't wait to share my handmade treasures with you! I design my stickers, send them to StickerMule who then prints and ships them back to me.